Vintage Bike Swap Meet will be happening at the show this year too! Please contact Harald for more information – info@toxikdesignlab.com or call 604-272-7840. Starting at 10am with set up and registration for the Show’n’Shine. Registration closes at noon. Cruiser ride to Iona Beach departs at 1pm. After the return of the cruisers is the famous Bike Toss. Award ceremony, prizes and swag give away to follow. We don’t have anything planned yet! Unfortunately the leader of the swap for the past few years is unable to organize it this year. 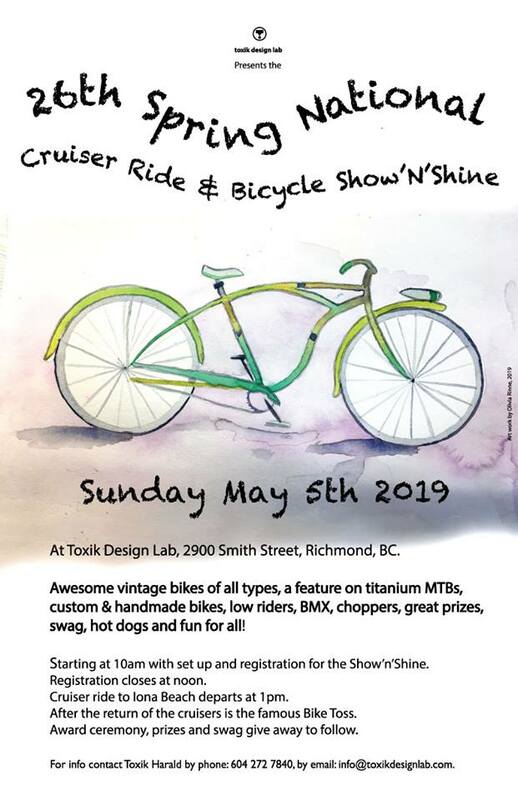 Toxik has decided to host a swap at the Show-n-Shine this year now; details added above! Harald has added a swap to the show and shine! Limited tables, so call him @ 604-272-7840 to reserve. I heard a rumor that this year the Show ‘n Shine is also a swap meet. Could this be the Spring Swap we are looking for?